Holiday Gold Gloss Gable Boxes 8-1/2x4-3/4x5-1/2"
Buy More Color Gable Boxes Save More! Lock Top gable boxes are for food service, party favors and promotional packaging and packaged flat. Boxes will support 10 pounds of product. This gable box has slits cut for a business card located on the bottom front of the box. 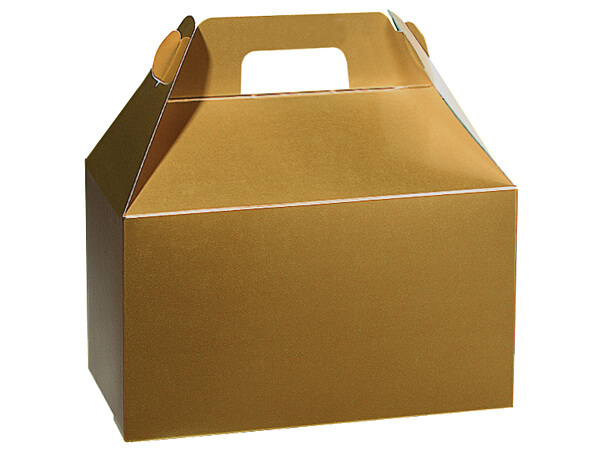 Gable Boxes are used for unique presentations and are great for food service, gift baskets, gift wrapping, crafts and promotional packaging.